TNT/truTV Final Four teamcasts to be branded "Team Stream Presented By Bleacher Report"
In five years, Bleacher Report has evolved from a site co-founder Dave Nemetz called “a player development system for writers” and one that wasn’t directly competing with the likes of SB Nation to a site that’s going to be featured on Final Four telecasts. Bleacher Report owner Turner Sports announced Wednesday that their Final Four coverage will again feature team-specific telecasts on alternate channels, which was known, but the fascinating new part is that the team feeds (which will air on TNT and truTV; the traditional broadcast with Jim Nantz, Grant Hill, Bill Raftery and Tracy Wolfson will air on TBS) will be branded as “Team Stream Presented By Bleacher Report.” It’s not just a name, either; the release notes that “This year’s coverage will also include an increased amount of integrated elements between the on-air presentation and Bleacher Report to further enhance the fan experience across all platforms.” What will this mean for Final Four coverage, and for Bleacher Report? From a viewer perspective, the name change here may be quite helpful, especially if they’re able to get it into TV listings and include which team each feed represents in those listings. One of the big issues with the teamcasts last year was that fans weren’t clear on what those telecasts were supposed to be and where to find the main national feed, leading to lots of screams of “Bias!” A feed titled (for example) “Kentucky Wildcats Team Stream Presented By Bleacher Report” would hopefully be much more clear and avoid some of those problems. Further integrated elements from Bleacher Report on the broadcast should also hopefully help reinforce exactly what each broadcast is trying to do. It sounds like they’ll be trying some other elements beyond just announcer preferences this year, too, with Turner’s release citing “comprehensive team and player storylines, custom graphics, music and show packaging, additional cameras capturing team content and school-specific replays, and halftime shows focused on each team with feature stories on each individual schools.” We’ll see how well it’s done and how well it goes over, but broadening what each teamcast is doing might help give the idea more staying power. Given B/R’s long-standing use of the “Team Stream,” too, this is an obvious marketing synergy. From a sports media perspective, this is a fascinating step in Bleacher Report’s continued evolution. How did they get here? Well, a lot of that has to do with Turner Sports’ 2012 acquisition of the site and how that cash injection has allowed B/R to go out and hire established writers like Mike Freeman, Howard Beck, Lars Anderson, and many others. They’re finding lots of success, too, setting a daily traffic record in January. The site’s still taking some criticism, but a lot of that is now about particular personnel moves and how much they pay lesser-known writers rather than issues with their content, which drove much of the early B/R criticism. 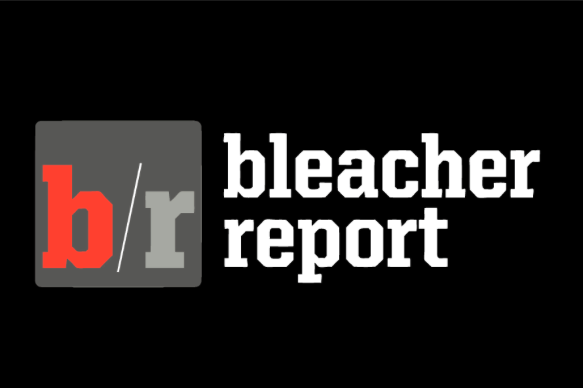 Bleacher Report is a site that a big company like Turner can more easily endorse now than when they first took it over, and that has a lot to do with why we’re now seeing the site more prominently mentioned during the likes of MLB and NBA broadcasts on Turner’s networks. Branding teamcasts after the site is an even more significant step, though. It’s a gamble that Bleacher Report’s reputation is now good enough that it’s not going to negatively impact Turner’s on-air properties. That’s a long way from where they were even five years ago, much less before that, and that shows how much Bleacher Report has changed.